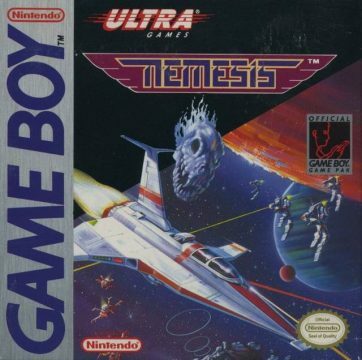 Like most Game Boy conversions, Nemesis isn’t really a completely new game, but it isn’t a just a port either. Although the levels themselves are technically different from the console/arcade versions, most are familiar variations, like the cave level from the original Gradius, a Moai level, an alien-type biological level, and a graveyard similar to the stage in the MSX and PC Engine versions of Gradius. There are five levels altogether. There are a handful of brand new bosses, which at least sets it apart from the original Gradius. Most of the music is snagged from Gradius and Gradius II. The game controls just fine, but for some reason, your ship doesn’t animate when it moves up and down, so it looks a little bit weird. There’s no equipment selection, but you can choose to have up to 99 lives without having to bring up a cheat menu. Like most of Konami’s Game Boy games at the time, it’s a fine downscaling of the series, but there’s nothing really special about it, especially with the monochrome graphics and tiny resolution. In Japan and Europe, Konami released a line of Konami Game Boy Collection games, featuring four Game Boy titles compiled onto a single cartridge. The Japanese version had Super Game Boy support while the European versions had Game Boy Color support. 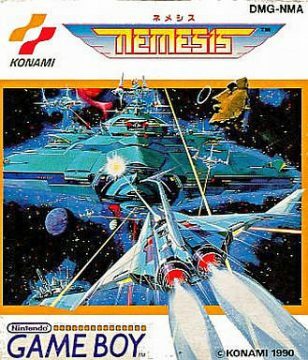 Nemesis – renamed to Gradius in all regions – is found on Vol. 1 in both regions. In the English manual, the main foe is named King Nemesis. Your ship has also been renamed the Proteus 911.